MDaware.org: A Spoon in the Bucket? I got in a recent twitter discussion with a number of people -- mostly @movinmeat -- on the impact of low acuity patients in the ED. He responded with an excellent, well-reasoned, but probably incorrect blog post (update: recently reposted at KevinMD). This is largely a response to both that conversation (edited Storify version here) and his excellent post. He asks: are low acuity patients congesting the ED? And his answer is yes. But I disagree. And it's fun to argue with people who you generally agree with. Nobody likes the low acuity patients who come to the ED. Few of us went into EM to take care of not-so-sick patients, there's a lot of charting, and there are just so many of them, which is why for years everyone thought that they were cause of crowding in the ED. But they're not. It's been studied very well, and the overwhelming cause of ED crowding is the boarding of admitted inpatients. ACEP has a report about it. There's even a big IOM report about it. Low acuity patients are frustrating, but not the problem. The basic model is input/throughput/output. 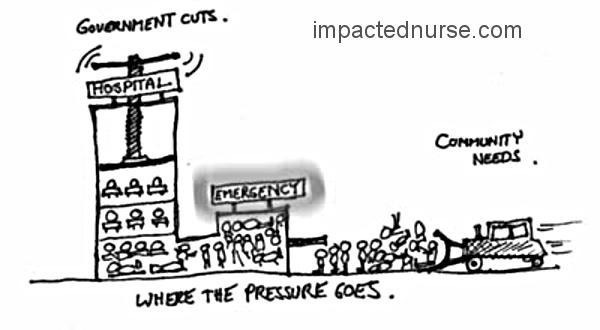 There are so many patients who come to the ED (input), they take so much time in the ED getting histories, IVs, xrays, etc (throughput) and then they eventually leave (output). The patient with the cold takes, say, an hour. The patient getting serial troponins for chest pain takes 6 hours. The patient admitted for an appy takes 4 hours... PLUS whatever time he sits around waiting for a bed upstairs (boarding). It's easy to see why 1 admitted patient waiting around for an upstairs bed takes up a much bigger piece of the pie than the silly URIs. Next, consider what clogging the system really means. We are quick to think about low-acuity ED visits as "unnecessary visits" -- like the healthy patient with a cold. Isn't the admitted patient boarding in the ED in the ED unnecessarily? Here's a simple example: a patient comes in with a twisted ankle. We do 2 main things: make sure this was a mechanical fall (history) and apply the Ottawa rules (physical), which is negative (assessment) and we tell the patient that they don't need an xray (plan). Rx 800mg ibuprofen, send home with return instructions. Explain again that they don't need an xray. Realistically, this takes an hour from door to door (although it probably shouldn't). Now a 50 year old with diabetes and CAD comes in with chest pain, with some concerning T-wave changes. Took his aspirin just before he got here. Is otherwise rock-stable. Slam dunk admission. Write some notes & orders, talk to the hospitalist. Done in 10 minutes. Now they just need to go to that inpatient bed. What happens if they board for an hour? or 4? or 12 hours? When I was in residency we would routinely board 30 patients at least 6 hours each every weekday. That's 180 patient-hours. As MM notes, the total facility time is a great estimate for resource load. So even if we are pessimists and assume every ankle and URI takes an hour, that's still 180 URIs we could have seen. His conclusion: "The lower-acuity patients are there less time, it is true. About 1-2 hours on average." Lots of discharged patients are in the ED for a few hours. But I think this graph is misleading with respect to how much time they spent in the ED. 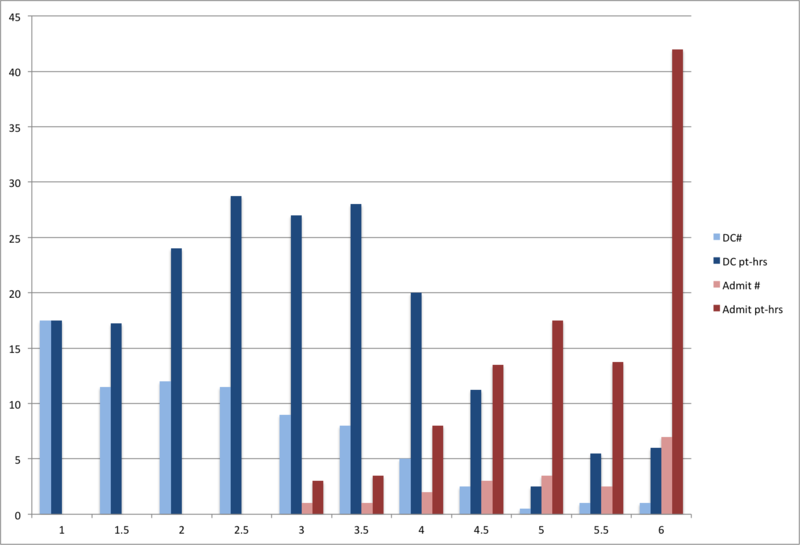 I reran his same numbers (being as true as possible from these graphs). I broke this up into 3 groups: discharged in 2 hours or less, discharged but LOS 2.5 hours or more, and admitted. How many patients were there in each group? How was LOS divided among these patients? 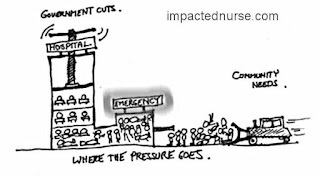 That is, 40% of the patients are discharged in 2h or less, but only take up 20% of the hours. 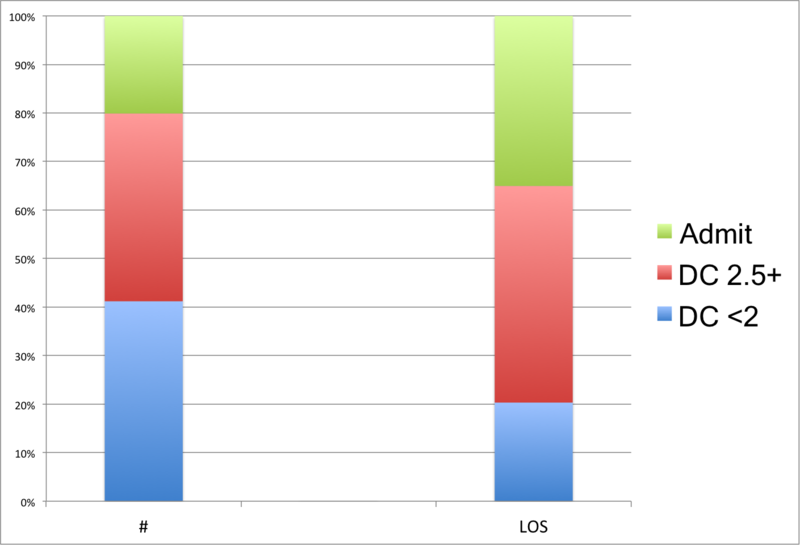 The 20% of patients who got admitted take up 35% of the LOS, and again, that underestimates their share because it treats everyone over 6 hours as taking only 6 hours. And, this is assuming that everyone who is discharged in 2 hours or less is a low-acuity patient. So maybe not a drop, and maybe more than a spoon. But the quick discharges are taking only a small portion of the total resources. And remember, this is only 1 hospital, and it's a hospital with remarkably little boarding. But even further: is that even the right group of patients to consider as "low acuity" or "shouldn't be in the ED"? It's very tough to properly measure the low-acuity patients. I agree that the 8% figure frequently quoted by ACEP is misleading. Not only is it based merely on triage category, which as @movinmeat notes may be incredibly misleading, but those recommended to-be-seen times are entirely made up. And it's very hard to figure this out based on administrative data. About 80-85% of all ED visits get discharged. Were these all visits that didn't need to be seen in the ED? What are the alternatives? Primary care offices? Urgent care center? Walgreen's? How easy is it to get into any of those? What are the hours? Most PMD offices are open during business hours, which is when many of us are actually at work. If you twist your ankle and don't know if it's broken, is it inefficient to come to the ED, where the lights are already on, the x-ray machine is running, and the tech is there? I don't enjoy the low-acuity patients. They're not that interesting, they make the haystack bigger (when a big part of our job is looking for needles), they talk back more, and if I wanted to work in an outpatient clinic I work in an outpatient clinic. I fiddled around with the graph a bit and made this graph. 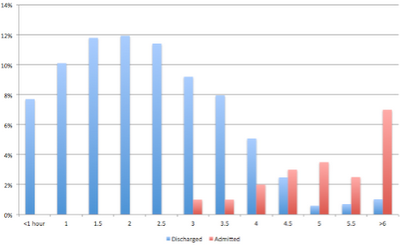 The light blue and light red are the same as movinmeat's: number of discharged and admitted patients for each LOS. The dark blue and dark red are their "patient-hours." 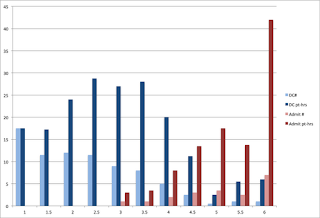 Each dark bar shows the total number of hours in the department for the patients in each group, e.g. the 17.5% of patients who are there for 1 hour get shown as 17.5 patient-hours (17.5x1-17.5) and the 12% of patients there for 2 hours are 24 patient-hours (12x2=24). This demonstrates 2 things. First, the admits have an outsized influence in patient-hours (which we know): the 7% of admitted patients who were there for 6h get 42 patient-hours of care (!). And further, the group in the middle -- patients who hang around the ED for a while but eventually get discharged -- seem to take up a big chunk of patient-hours. This is in line with a recent study from Steve Pitts, Michael Handrigan, Art Kellermann, and Jesse Pines, where they looked at NHAMCS data** and showed a big influence on crowding is ED workup: labs, imaging, etc., a lot of which might be resource-saving in the long-run because it avoids admissions. But it does look like "output" is no longer the only culprit in ED crowding: "throughput" may be as big of a factor. But it's still not input (not yet, anyway). I suppose a major driver of what crowding looks like is how well-run your facility is. We have solved the boarding problem, yet are still overcrowded. As we both have noted, the absence of a cohesive outpatient care network forces patients with low acuity injuries and illnesses to the ER. So for us, the only crowding we still experience is due to these folks. I'll let you know when we have solved the rest of healthcare's ills. There is a myth that low acuity = primary care type patients. Sure, there are some people who don;t need to be in an ED. But there are a helluva lot more low triage (ATS triage 4 or 5) who NEED the services of a well-lit, well-stocked, well0staffed ED - the little old lady with a sodium of 124, the child with a foreign body up it's nose. They may not be acute MIs, septic shock or polytrauma - but they need to be dealt with - whether admission for the LOL with Na 124 needing workup, or a smidge of ketamine for the child who won;t let you get close to remove the FB. This is ED work, not GP work. Is Roc vs Sux Moot?